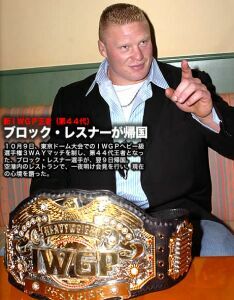 Brock Lesnar became the fifth foreign IWGP Heavyweight Champion in New Japan history. Brock Lesnar defeated Kazuyuki Fujita and Masahiro Chono with the Verdict (F5) on Chono to become the 44th champion. Congratulations goes out to Mr. Lesnar who is now proudly carrying one of the most prestigious championships around today made of course by Reggie Parks, Dave Millican and designed by Richard Mann. Pictures obtained from http://www.puroresufan.com/ with permission. 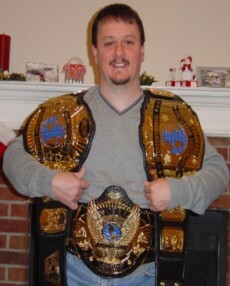 For more detailed information on Brock's win go to http://www.puroresufan.com/.